It’s been rumoured for weeks, it was more than hinted at last Saturday evening (at least the fact that these two wouldn’t be Porsche drivers next season) – and now it’s confirmed: Lucas Luhr and Mike Rockenfeller will be Audi drivers in 2007. 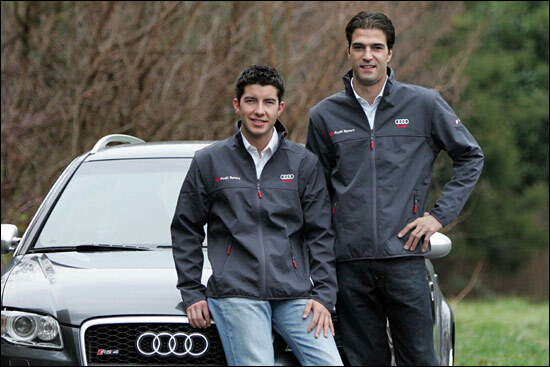 The Audi statement begins with “Lucas Luhr (27) and Mike Rockenfeller (23) will strengthen the Audi driver squad in both the DTM and in sportscar events with the revolutionary Audi R10 TDI Diesel sportscar during the forthcoming 2007 motorsport season”. It could be argued that Luhr was already racing for overall victories with the Penske RS Spyders this season – but overall wins are the clear objective in 2007, in the DTM and in an R10. What we don’t yet know is where Audi Motorsport is aiming to race its R10s – or who, in addition to Luhr and Rockenfeller, will be driving them. "Mike has demonstrated impressively at the wheel of the LM P2 Porsche and in the Grand-Am Series that he also possesses the necessary talent for this car,” says Dr. Ullrich. Porsche placed Rockenfeller in one of the Penske RS Spyders at Petit Le Mans this year – but the ‘lure’ for he and Luhr, of racing at the front of LMP1, and in the DTM, was too great to turn down. Their replacements as ‘factory drivers’ at Porsche will become known in due course: it is likely that one former Porsche man will return to the official fold. More prototype news later today (which definitely was mentioned at the Porsche Awards ceremony) should set the scene for the regulations to be announced by IMSA, for the 2007 ALMS (in particular the starting point for P1s and P2s, and the balance between them), and perhaps then the factories concerned will be able to make their plans known for the new season.